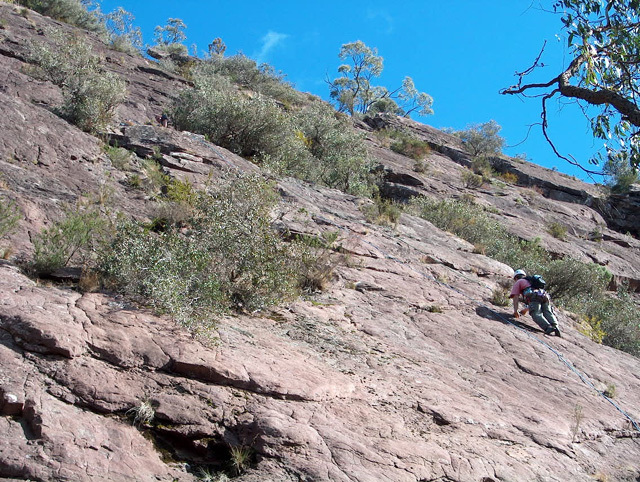 The Cathedral Range offers a wide variety of climbing from extremely easy up to mid-twenties grades. 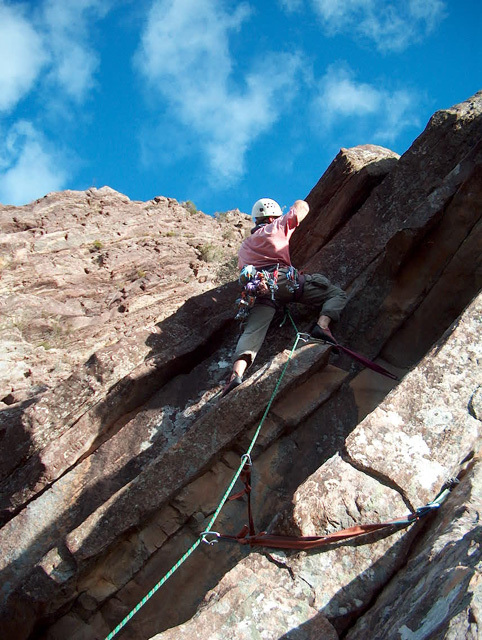 A good hour and a half's drive from Melbourne, it's a popular trad climbing destination for city dwellers. The area also boasts excellent camping and hiking with some striking views, and friendly fauna. 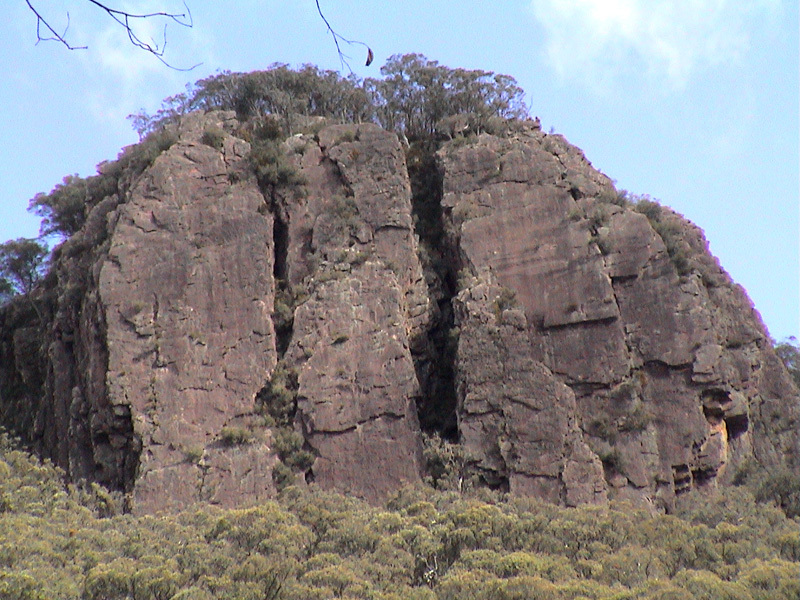 The rock is a dark grey sandstone, similar to Arapiles in texture, though the similarities stop there. Access involves some short but steep hiking. Also bear in mind that this is a heavily forested mountain range, so it will draw it's share of weather, and stay damp for some time after rain. Above Right: Cathedral Range as viewed from the Buxton to Alexandra Hwy. For a first visit and some tall, but easy to intermediate routes try the Mt Sugarloaf cliffs. Instructors looking for somewhere to take beginners top roping also use the smaller outcrops in this area. For more starred climbing, harder routes (though still with a few easy ticks), but poorer access, head for the "North Jawbones" area for some slabbing action. Climbing at some of the other locations is scattered and of less quality, though there are a few hidden gems if you're prepared to hunt. Camping is best at the Cook's Mill area, more or less in the centre of the park. Cost is $10.20 per tent, per night, which is exorbitant in my view, but at least you get toilets, fireplaces (BYO wood), one gas barby, nearby pleasant stream for running water (which you might want to boil before drinking), and a large choice in camp sites. Looks like they could accommodate a 100 people if need be, though we only saw 4 tents during our August trip. Also of note, is the wealth of native animals that populate the site. In one night we saw no less than two wombats, two lye birds, and numerous wallabies, kangaroos, possums, rabbits, etc. Basically the place is swarming with wildlife. Access from is from the little town of Buxton, 100km north-east-ish from Melbourne. (See approach map). From here, head down the road to Marysville for about 4km and take a left onto Mt Margaret road. Fire up this, forking left at 3km, and striking the Sugarloaf day visitors hut after another 5km of winding dirt road. (If you continue another 5km more you'll get to the North Jawbones car park). 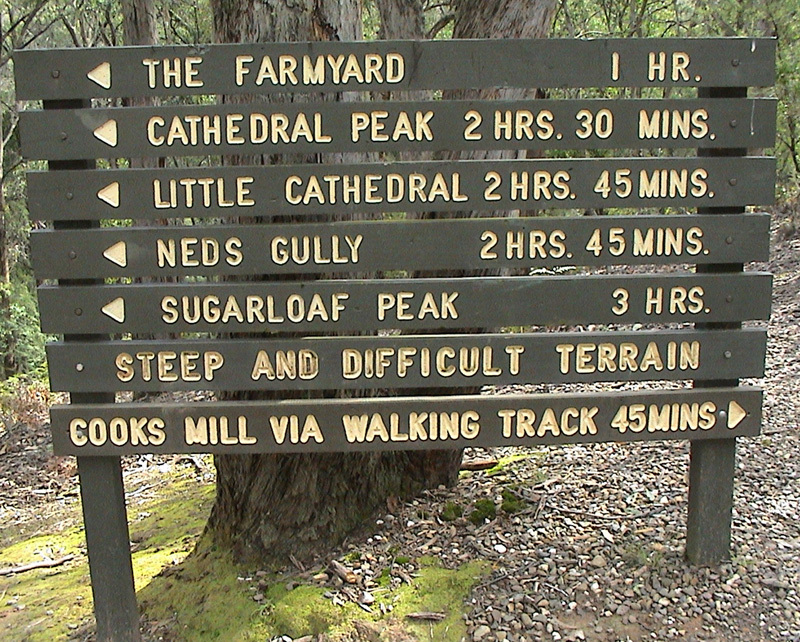 From the Sugarloaf hut, you'll see two walking tracks departing from the left of the road. Above Left: Me bouldering around on the main cliff at Sugarloaf. The terrain is very featured and thus fairly easy, though protection can be a bit sparse. Above Right: View from the summit of Mt Sugarloaf. The left-hand path heads steeply up to the summit via the ridgeline. However, you'll want to take the right path (labelled "wells cave"), for access to the base of the cliffs. Well's Cave (pictured below) is a fun little system that anyone who isn't totally overweight, can squeeze through, and offers an alternative track to the Sugarloaf summit, though it involves a few grade 1 or 2 moves (i.e. keep an eye on your kids). I really recommend walking to the summit via either path, or make a loop out of it for an enjoyable 1.5 hour hike. On a good day the view is simply stunning. 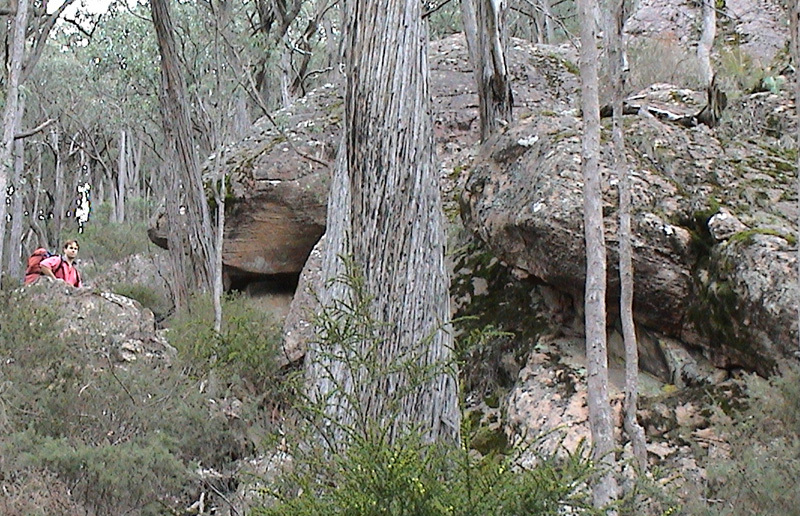 Above Left: The sugarloaf boulder is accessed 100m up the left hand track. It's diminutive, polished features didn't seem very exciting to me, despite the 17 odd documented routes. Above Middle: We found a far more interesting boulder quite a distance further up the left hand track, nearing the Sugarloaf summit. Above Right: Inside Well's Cave. 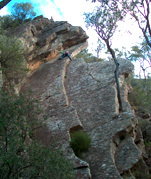 The two routes given stars in the Eastern District Guide, Cherry’s Flake and Cave Slab, both provide great climbing. Cherry’s Flake, a grade 8 line towards the left end of the Main Face, follows a series of right facing flake cracks. These flakes provide good opportunities to place gear, an opportunity that doesn’t necessarily present itself on the other routes on the Main Face. Cave Slab is a grade 11 route that goes up the centre of the large slab of rock that leans against the right-hand side of the Main Face to form the “cave” on the walking track to the summit. It offers good consistent slabbing on positive holds, but has essentially no protection. A good route to top-rope, or if you're feeling cool calm and collected, to solo. The first three or four metres of the direct route up the slab are disgustingly hard, feeling more like grade 17 or 18. 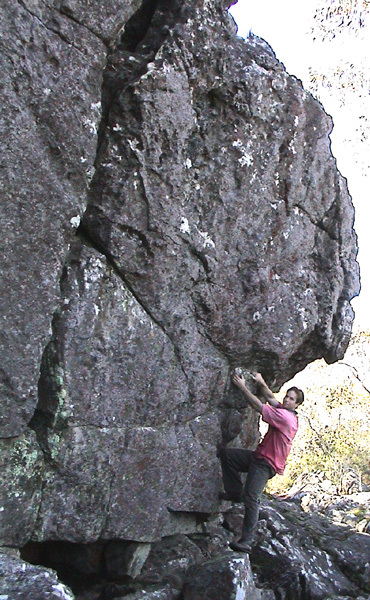 These moves are avoidable though, and after this bouldery start, the route is more in line with its grade. 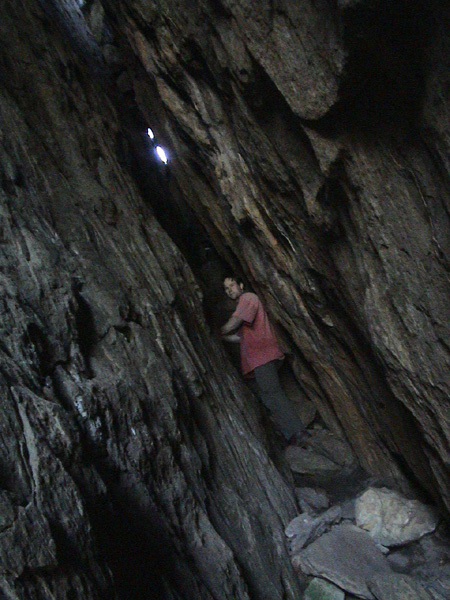 Descent is a bit tricky and involves scrambling / chimnying down the “cave”. Access is from the small town of "Buxton". (See approach map). Basically you take the Cathedral Lane turn off 9km out of Buxton, then the Cathedral State Park turn off 3km away, before finding the Cooks Mill camping ground 5km further on. Drive another 500m or so to find the North Jawbones car park on your right. (Alternatively drive in from the Mt Sugarloaf approach). The cliff face itself is visible across the valley from here. Right: North Jawbones cliff face. Speigal's Overhang is on the far right of the face. Consult the VCC guide for details. A walking track leads to the North Jawbones cliff. This well established walking track (marked with orange arrows) initially descends to a creek on some steps, then climbs steeply up the other side. The old guide book is a bit misleading here. What you need to do is continue up the track for 500m or so until you come across some moss covered boulders (pictured below) about the size of a house on your right. Here the track veers sharply left. You, however, need to continue straight up, departing the tourist track and going bush, just left of the aforementioned house sized boulders. You should find a reasonably visible track, though it's initially very difficult to find, and many people miss it altogether. (Click images below get a clear idea of where to turn off). This "track", is very steep and difficult to negotiate with a heavy climbing pack. Fortunately the base of the cliff appears after about 150 metres of scrambling. Walk right along the base to access Speigal's Overhang the 116m, three star grade 10, where most newcomers start. Above Left: For access to the North Jawbones, start in the car park. Above Middle: Depart the track at the house sized boulders (that red dot is me). Above Right: Head straight up, just left of this boulder. 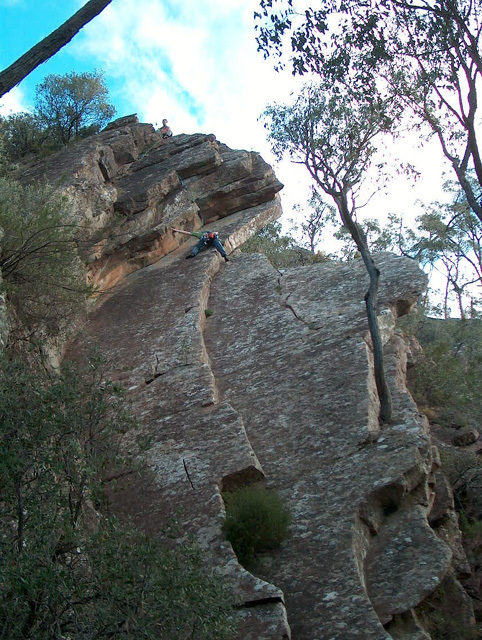 Above Left: Climber seconding Speigal's Overhang the 116m, three star grade 10. Above Middle: Michael seconding P1 of Junglescope (13). Above Right: Michael leading P2 of Junglescope (13). If Speigal's Overhang (10) is taken Junglescope the 144m grade 13 (see above, and images page for full sequence) is a nice warm up, provided you're handy at finding trad placements and don't mind the occasional loose edge when slabbing. You can do it in three pitches (rather than four), and recently added double ring bolt anchors exists a top P1 and P2, though at the time of writing this report, the rings atop P1 were loose. Above Left: Michael through the crux of Fruit Hustler (17). Above Right: Guy seconding. The corner crack Bathtime Gurgles (18) resides just left of Fruit Hustler the 45m grade 17 and can be found on the far right of the crag. Bathtime Gurgles is not one to onsight if grade 18 is your lead max. It requires fiddly small wires or micro cams in the finger tips only crack found in the middle third of the route before curving right to the arête. Just when the finger crack gets too small for even a pinky, a layback/undercling of a flake is possible. A massive jug rewards those who gain the roof. Fruit Hustler 45m grade 17 (see above, and images page for full sequence), takes the enticing crack just right of Bathtime Gurgles corner. 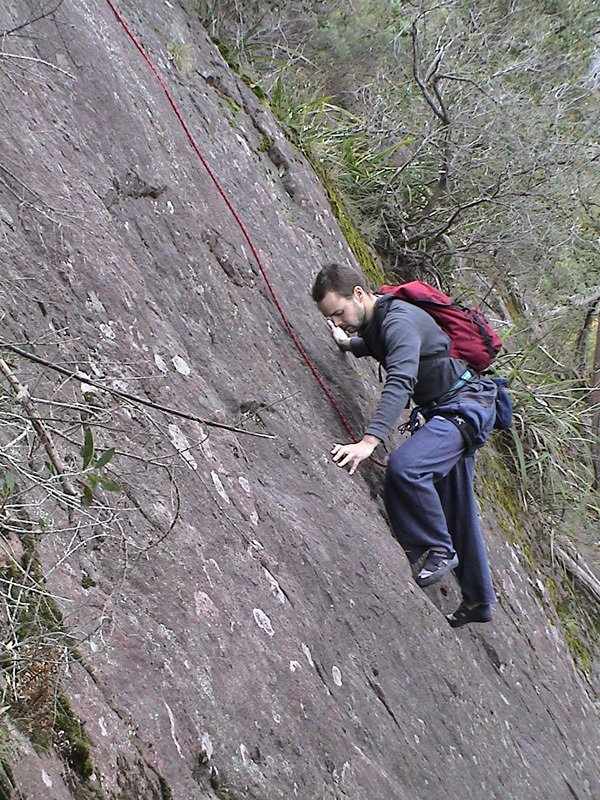 The first two thirds of the route is low stress, with lots of stances from which to place gear. Gaining the arête just below the roof, the climber can mount said arête for a bomber rest, or even step off and walk down, should the roof look to goey. 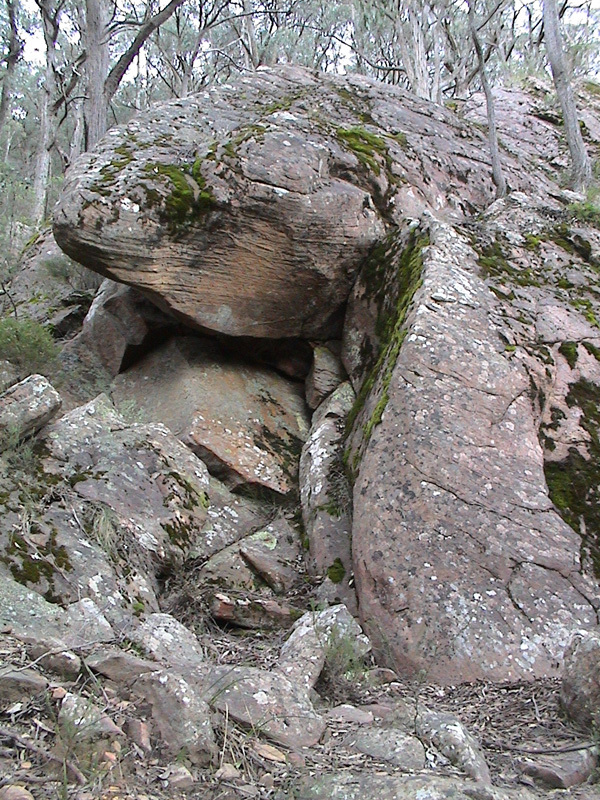 A wild stem (see above right), leads to a massive jug from which the crux roof moves can be dispatched (see above left). Warning, get some gear in while hanging (or sitting on said jug), because there is little else until you traverse left into an easy crack system that leads to the summit. Falling off during this traverse would not be pretty. Also beware rope drag. The South Jawbones is not as good as the North Jawbones, being far more vegetated and of a lower angle. It's also visible from the car park. Access is the same as for the North Jawbones, but instead of departing the tourist track you continue up it a little further until you reach "the farmyard", a clearing of sorts. Exit left of the track and go bush. Consult the VCC guide for more details. The walk into the creek crossing below the final walk up the hillside to Bissets Pinnacles is quite painless. When I walked in, I remember wondering what the fuss about access was. I could see the Pinnacles up the hillside what looked like a short, albeit steep, 5 minute walk away. Looks in this case were deceiving. The final walk up to the Pinnacles requires hideous bashing through some of the thickest, nastiest prickle bushes I've ever experienced. Whilst I'm no expert on prickle bushes, the fact that I was finding broken off pieces of prickle in various parts of my anatomy for weeks after the trip makes me fairly confident that these prickle bushes are not to be trifled with (tip, try crawling on hands and knees to avoid some of the worst sections, and wear a thick jumper that your happy to throw out after getting home). When you arrive at the Pinnacles themselves, the quality of the rock really stands out. It looks and feels like granite, but is apparently volcanic rhyolite, which is steep and hard, and features some very clean cracks. The main attraction here is Spiral Architect. This route takes a thin crack up a steep face on a pinnacle. The route, which is a ***18, is somewhat marred by the fact that the climber is required to perform a couple of awkward aid/scrambling moves to get to a platform from where the main climbing begins. The main crack, once reached, is however awesome. This crag is not user friendly, with tough access to and around the crag, but offers some great climbs for those willing to put in the effort. Eastern District Guide - A climbing guide book, edited by Glenn Tempest, Richard Smith and available from local climbing shops, or the VCC. Chockstone Forum Topic - Some comments from our members about bouldering out there. Cathedral Range State Park - Park's Victoria's page on this area. Cathedral Ranges - Limited information from Rockclimbing.com web site.